EUGENE, Ore. – The Huskers (1-1) rallied late, but a miserable first half put them in too large a hole to overcome and they ultimately fell to the Oregon Ducks (2-0), 42-35. A Nebraska touchdown early in the second quarter brought what was a 21-7 game within just a score. The Huskers opened the game giving up a touchdown and throwing an interception on the first offensive play of the game. Autzen Stadium was rocking and the Huskers looked frazzled, but the five-yard run from tailback Tre Bryant seemed like it had brought things back steady for the Huskers. Then an avalanche ensued. Oregon scored 21 points in the last seven minutes of the first half, turned the Huskers over one more time and rang up 409 yards of total offense in the first half. The Huskers’ defense – after giving up 497 against Arkansas State in the opener – looked overmatched and uninterested in slowing the Ducks. In the third quarter, the Huskers made up ground. They limited the Ducks offensively and won the frame 14-0 thanks to two touchdown grabs from wideout Stanley Morgan Jr. The game was there – the Huskers were back within two scores heading into the fourth – and Oregon did nothing to slam the door shut. Early in the fourth, Thomas Graham Jr. picked off quarterback Tanner Lee, setting up Oregon in Nebraska territory with the chance to put the game out of reach. The Ducks would miss a field goal wide right and give it right back to the Huskers. With just under five minutes to go, star running back Royce Freeman fumbled the ball and gave it to the Huskers at the 23-yard-line. A short touchdown run from tailback Mikale Wilbon two minutes later brought Nebraska back within seven with 2:47 left in the game. Nebraska got its stop on defense and Lee and company came back out, looking to knot it up. Lee then threw his fourth interception of the day on the first play of the drive. The trip to Eugene will go down as one of the most challenging of Lee’s career. He finished just 19-for-41 with four picks. He totaled 252 yards on the day and three scores, but the throws he missed – and there were a lot – were more impactful than the ones he made. Morgan finished with 103 yards on seven catches, his second straight 100-yard game, and Bryant totaled 107 yards and a score before leaving the game with a knee injury. The Nebraska defense blanked Oregon in the second half and only gave up 157 yards, but the offense couldn’t overcome the first half blunders. 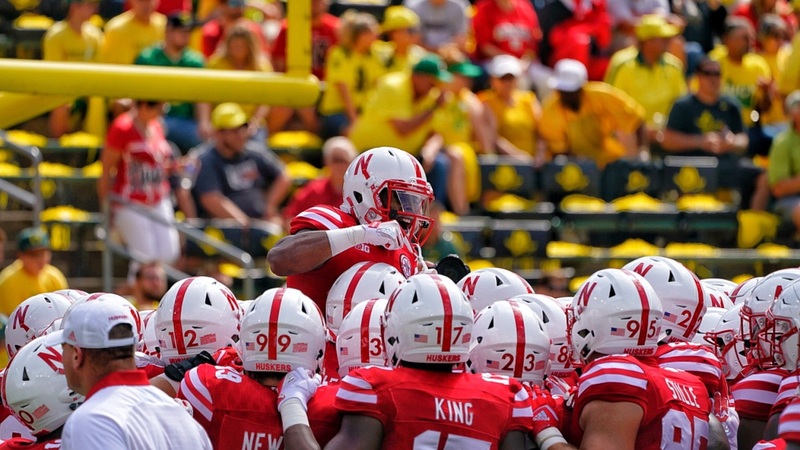 Nebraska will now head home for a Sep. 16 game against Northern Illinois.